Welcome to the Apogee Element Series Video Tutorials. In this video we’ll walk you through how to get the Element Control software installed onto your Mac, and working with your Element Interface. 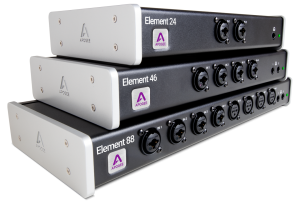 The Element control software is free when you register your new Element on the Apogeedigital.com website. Navigate to the support section, click on the Element Series link, and two registration buttons appear. For full registration, use the “Register and Download Software” Button. If you don’t have your receipt, or don’t want to register and just want to download the software, use the “Download Software (Express)” button. While we are waiting for the software to arrive at our inbox, let’s make the Element connections to your computer. Connect the included power supply to Element, then connect a Thunderbolt cable between Element and your Mac. Once you have the email, click the link to download the software. If you don’t see the email yet, check your spam and trash folders in case it got filtered there. Alternatively, you can search your mailbox for @apogeedigital.com. Inside the downloaded file are several items. Select and open the Element Installer.pkg. Follow the prompts through to a restart of your computer. Open Element Control and it will automatically recognize your Element interface.